He was bawling his little lungs out when they handed him to me. 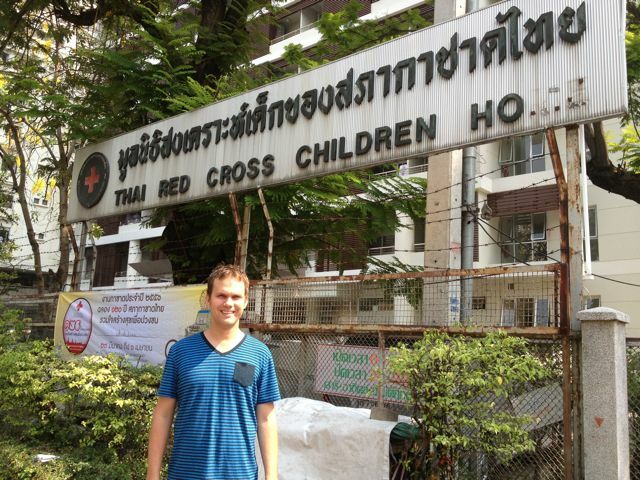 I was on my first visit to the Thai Red Cross Children Home in Bangkok and when a staff member handed little Phop over to me, I was immediately nervous. I carried him to the play room, following the other volunteers that had come with the Church of Sweden. Every one else had a quiet, obedient child in their arms. I had landed the vocal 3 year-old. “Phop always cries,” explained Mimi, one of the other volunteers. I tried bouncing him up and down as I carried him around the play room. No luck, he was still screaming. I tried to distract him with a stuffed toy. Even worse. “I’m on to your tricks!” it seemed he was saying. “It’s OK buddy,” I tried. “Here, how about this toy?” The action figure I held up drew a brief flicker of interest (he was wearing action figure PJs) and then it was back to bawling. Just as I started despairing that I would be the only volunteer who could not handle a kid, Phop, calmed down and stopped screaming. A miracle! I tried putting him down. Maybe he wanted to play? Nope. He was clearly not interested. He just wanted to be carried around. So we walked around the play room looking at the other volunteers and toddlers, me talking to him and him content to have an adult all to himself. And that’s how it went for two whole hours, with a break where he let me feed him chicken noodles and an obsession with standing on the windowsill for the last five minutes. Then it was all over, I handed Phop back to the staff, I saw him run over to his crib and jump in. “It’s always hardest for us to say goodbye at the end,” offered another volunteer. Indeed it was. I hope to see you again, Phop. Previous PostHow I spent my time once I finally found IKEA BangkokNext PostPhoto Quiz Time! Bangkok, San Francisco, Los Angeles or London? That totally sounds like your luck Bjorn. Thanks for the updates. We miss you guys. Finally……some do gooding! ;-) Tim Ferriss would be proud! Enjoying the blogs – add some colour to the post-Christmas routine! Oh God Bjorn Bjorn! That rips my heart out! The only dream I have is to be a Missonary and be with little ones! This kills me!~ He liked you! How AWESOME! … Little boys … Dang! Sarah! Thanks for the awesome comment. My gut reaction is DO IT!! There are so many organizations to volunteer with internationally. Not amazing pay in terms of raw dollars but a lot more rewarding than the status quo. You would be an awesome missionary. For reals. This is the best story. I loved it. I could just see it all in my mind’s eye and it made me feel all warm and fuzzy inside Keep em coming. Thanks Karin! I’ll post a follow-up soon! Good work Bjorn – you helped entertain that kid for 2 hours! You should have tried out your humor on the little guy – it would have cracked him up. Pingback: Playing around is hard work | Life. Service. Travel.